Beganto Inc, a leading Java Development company, provides extensive software development services using Java/J2EE/J2ME technology that delivers robust, scalable, and cost-effective software solutions within your budget. 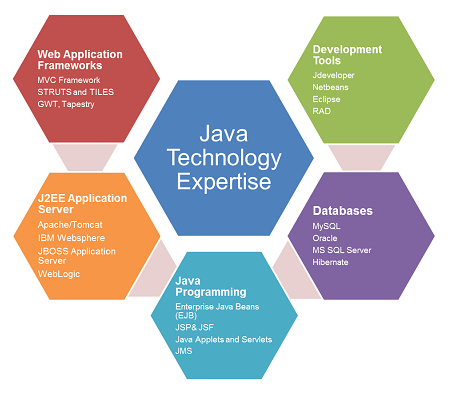 We ensure high quality application and shortened development cycles by employing the best-in-class Java/J2EE/J2ME Application Development framework in our development work as per the project requirements. We provide design and development services to deliver software that efficiently utilize the services available from Java/J2EE/J2ME application servers and the Java/J2EE/J2ME framework. Over the years, Beganto has been providing Java development services to its clients across the globe. We have the right experience in Java and J2EE frameworks to develop cutting-edge solutions for SMEs and large enterprises. We guarantee our client for the highest quality standards and the timely delivery of software product. Outsourcing Java Development with us offers you the breathe-easy feeling for every stage of SDLC from project specification to project support & upholding. At Beganto, we hire dedicated Java developers to work under your supervision and support your Java team accruing significant skills and commitment entirely for your project and business requirements. Our Java programming services are custom oriented and focused on combination of pioneering solutions and proven methodologies that helps in delivering successful technology solutions. Beganto has rich experience in Java and J2EE web application development & programming services. We provide design and development services that can utilize efficiently the services available from Java application servers and the J2EE framework, including Struts, Servlets and Java Server Pages (JSPs), Enterprise JavaBeans (EJBs), Java’s Messaging Services and JDBC. Whether you are looking for an end-to-end Java Development or a precise Java component for your business, we have the solution to all your needs. We take pride in offering Java Software Development services to our clients. For further queries on Java Development please feel free to contact us at . You can also call us at +1-510-280-0554. Don't Mind! Just checking spam.